I’ve been wanting to get a copy of Matthew Quick’s Sorta Like A Rock Star for the longest time, because I thought it was one of those band books — sorta kinda like Antony John’s Five Flavors of Dumb — and I enjoy those books a lot. But no one ever gave it to me for Christmas or my birthday, so after two years of it being in my wish list, I decided to splurge on it shortly after Christmas. 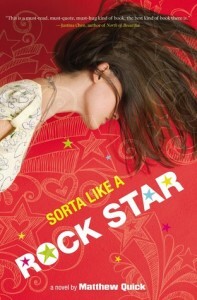 As it turns out, though, Sorta Like A Rock Star is far from being a band book. We meet Amber Appleton, so-called “Princess of Hope”. Amber lives in a bus with her mom and her dog, Bobby Big Boy (aka 3B aka Thrice B aka BBB, who is Catholic too, btw) ever since her mom’s latest boyfriend kicked them out. Despite all this, Amber still has a positive outlook in life and she does her best to help other people who need her (going around in her trusty bike she parks on thule bike racks): her own group of outcasts in school, their adviser for the Marketing Club, some Korean women in a Catholic church where she serves and even a retired veteran who she befriends through a letter-writing exercise in class. She’s such a ray of light to other people that when something truly terrible happens to her, Amber teeters on the edge of darkness — and there doesn’t seem to be any answers to her questions in the face of this tragedy. I didn’t really warm up to Sorta Like A Rock Star when I first read it, because I sort of couldn’t get into Amber’s way of speaking and her über-optimism. I’m a pretty positive person, but Amber just takes it waaaaay above what I normally know. But somehow, I started feeling for her, especially since I had a view of how much of a struggle it was for her at “home”. And then that terrible thing happened. And my heart just went out for her. I found myself sniffling in the middle of the night, and I suddenly couldn’t put it down. My heart went out for Amber, and interestingly, to Father Chee, who sat with her through her ordeal. Her questions were painful, and it also hurts me every time her priest friend finally answers, “I don’t know.” Sigh. It takes a while to get used to at first, especially since Amber is just OH SO POSITIVE. But when *that* thing happens, she will steal your heart. :) Thanks for the visit, Cass!